Soul Jazz is always worth keeping an eye on for some interesting tunes, but movie fans are getting in on the act with Can You Dig It? Black Action Films 1969-1975, which is out today. Available as a two CD set or limited edition double album set, it charts the rise of black action flicks from the late 60s onwards, throwing in a 100-page booklet, a limited-edition mini-film poster, cards and stickers. There's some very cool soul and funk on-board too, from the likes of James Brown, Curtis Mayfield, Willie Hutch and Roy Ayers, helped along by some big arrangement from Quincy Jones, Johnny Pate and JJ Johnson. Want to see the tracklisting? Check it out over the page. or buy via Amazon now for £9.88. The two vinyl releases are available from Soul Jazz itself, more details here. Throughout David Lean's impressive career as a filmmaker he often worked with the talented French composer Maurice Jarre. Jarre composed soundtracks for many of Lean's award winning productions including Lawrence of Arabia (1962), Doctor Zhivago, (1965), Ryan's Daughter (1970) and A Passage to India (1984). The new DVD release of Maurice Jarre: A Tribute to David Lean from Milan Records is a wonderful celebration of the films that Lean and Jarre worked on together. 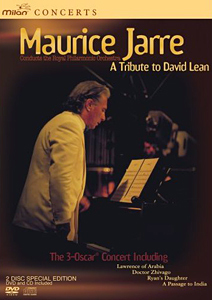 This impressive two disc DVD set features Maurice Jarre's 1992 tribute concert, which was performed at the Barbican Center in London with the Royal Philharmonic Orchestra after Lean's death in 1991. During the concert, clips from the films that Jarre and Lean collaborated on were shown on a large screen behind the orchestra. These clips also feature behind the scenes footage of David Lean directing the cast and crew while making his films, which adds a personal touch to the event. Hopefully you caught our recent Cult Clip of Blood On Satan's Claw. If you liked what you saw and indeed liked what you heard, you may be interested in a reissue of the soundtrack. It's released by the always-excellent Trunk Records and features the haunting orchestral (with a twist) score of Marc Wilkinson. The CD reissue is accompanied by a very limited vinyl reissue of just 500, so you'll need to get in quick if you want one. No specified date as yet for the reissue, but you can find out more and see stills from the movie at the Trunk website. 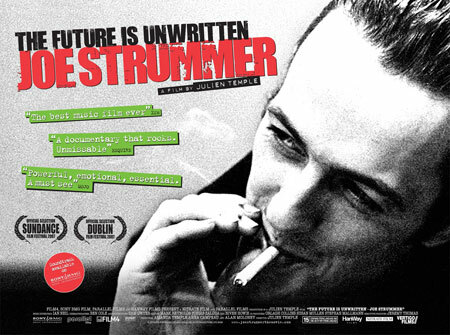 At cinemas from from 18th May is a biopic of the Joe Strummer, courtesy of longtime friend Julien Temple - The Future Is Unwritten: Joe Strummer. Temple's movie - billed as a celebration of the man - contains never seen before footage of Joe Strummer including studio sessions, archive and early childhood footage, interviews with Strummer fans, including Martin Scorsese, Bono, members of Red Hot Chilli Peppers, plus friends and family and of course, former members of The Clash. If you've got the DVD of Get Carter (and let's be honest, it's an essential purchase which you can pick up for under £6 from Amazon ), you'll recognise this clip of Roy Budd soundtracking the opening sequence of the movie live, dressed in a particularly dodgy blue suit.